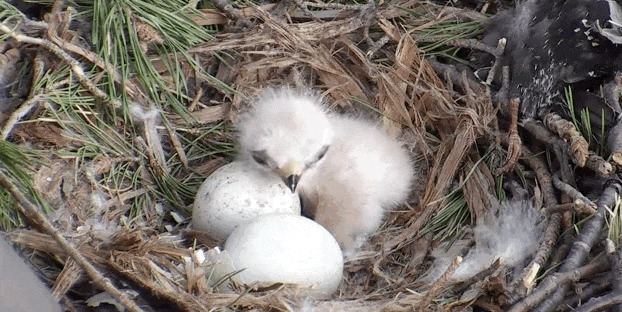 Tiny baby hawks are being welcomed to the world by their mom — right this second. Red-tailed Hawks typically put their nests in the crowns of tall trees where they have a commanding view of the landscape. They may also nest on a cliff ledge or on artificial structures such as window ledges and billboard platforms. Both members build the nest, or simply refurbish one of the nests they’ve used in previous years. Nests are tall piles of dry sticks up to 6.5 feet high and 3 feet across. The inner cup is lined with bark strips, fresh foliage, and dry vegetation. Construction takes 4-7 days. Mammals make up the bulk of most Red-tailed Hawk meals. Frequent victims include voles, mice, wood rats, rabbits, snowshoe hares, jackrabbits, and ground squirrels. The hawks also eat birds, including pheasants, bobwhite, starlings, and blackbirds; as well as snakes and carrion. Individual prey items can weigh anywhere from less than an ounce to more than 5 pounds. Responses to "Sleepy Baby Hawks See Sunlight For The First Time"